DEva is a plug 'n play, no-compromise, completely integrated plant lighting solution. 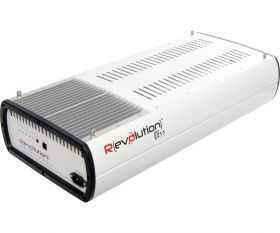 Its state-of-the-art, low-frequency square wave electronic ballast is built right into the fixture. The DEva includes an EU-made 2100 Âµmol/s double-ended 1000W HPS lamp. All you have to do is plug it in and start growing. Designed from the ground up, the DEva 1000W DE ballast runs cool and quiet, emits virtually no electromagnetic interference, and oscillates at just 140 Hz instead of 70,000 to 100,000 Hz. As such, it perfectly powers the included 2100 Âµmol/s EU-made DE HPS lamp. The DEva adjusts the output waveform to continually optimize the lamp's output as it ages. The DEva's avionics-grade capacitors are rated for thirty-six years of continuous operation. With DEva, you'll enjoy a safe indoor garden with high performance, long lamp life, minimal PAR light depreciation, and low maintenance costs.